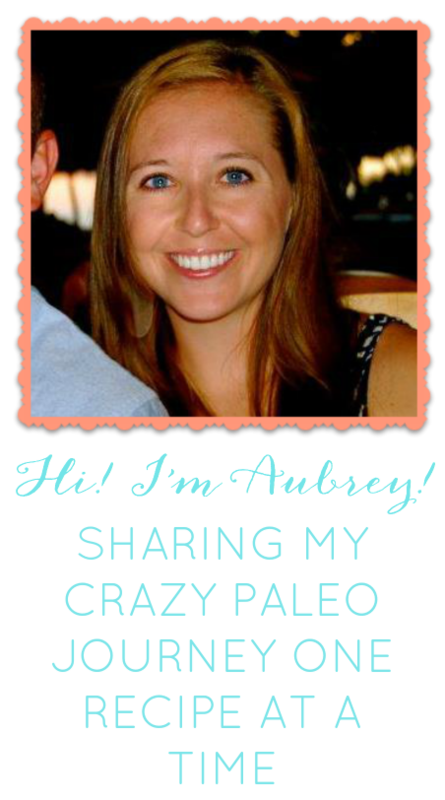 Paleo made Painless: Catch up time! Sorry it has been a while since my last post! It has been a crazy week. I really have a lot to write about- but let's start a recap with some food! 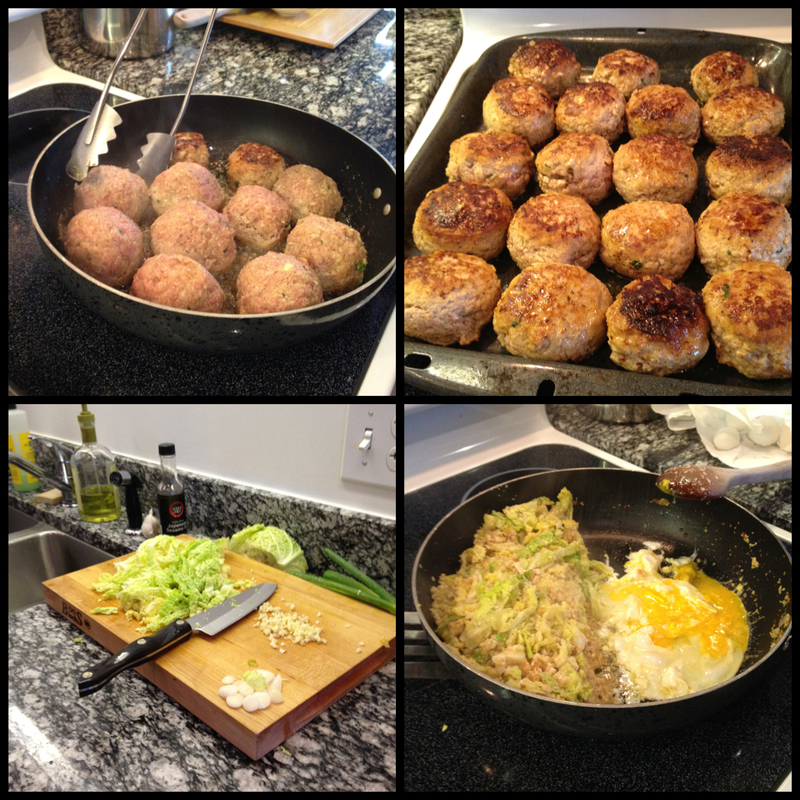 We have had some pretty delicious post WOD meals this week. Matt & I have still been doing two-a-days a few days a week at the box. 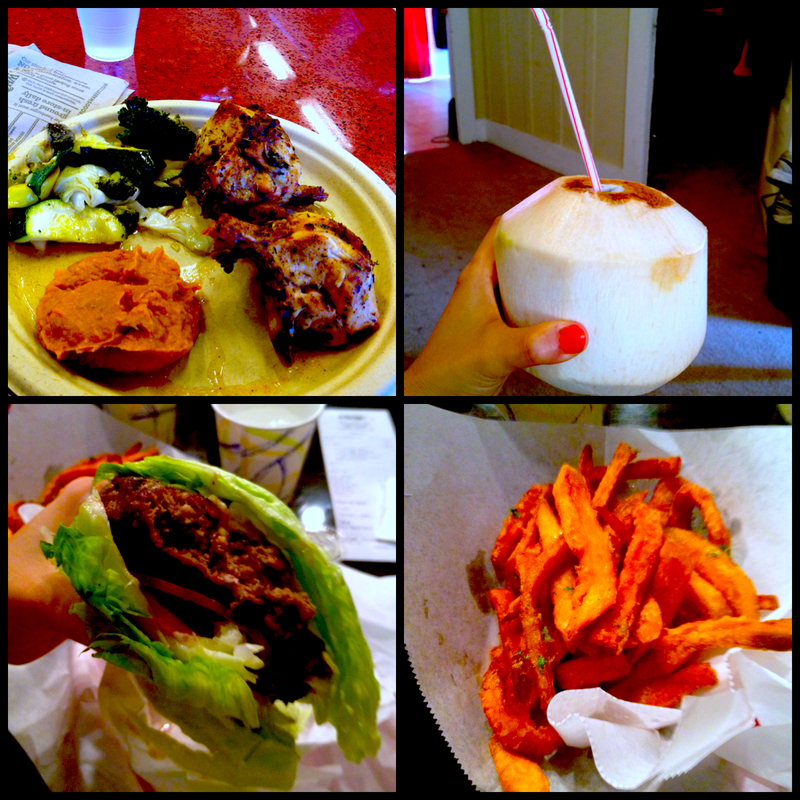 Here are some random meals we have had- burgers, chicken, veggies and DELICIOUS coconut water from Whole Foods. One day Matt had made an AWESOME brunch. Eggs, spinach, bacon, avocados and blueberries. 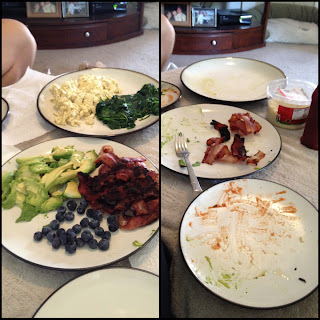 This a before and after view of the brunch. 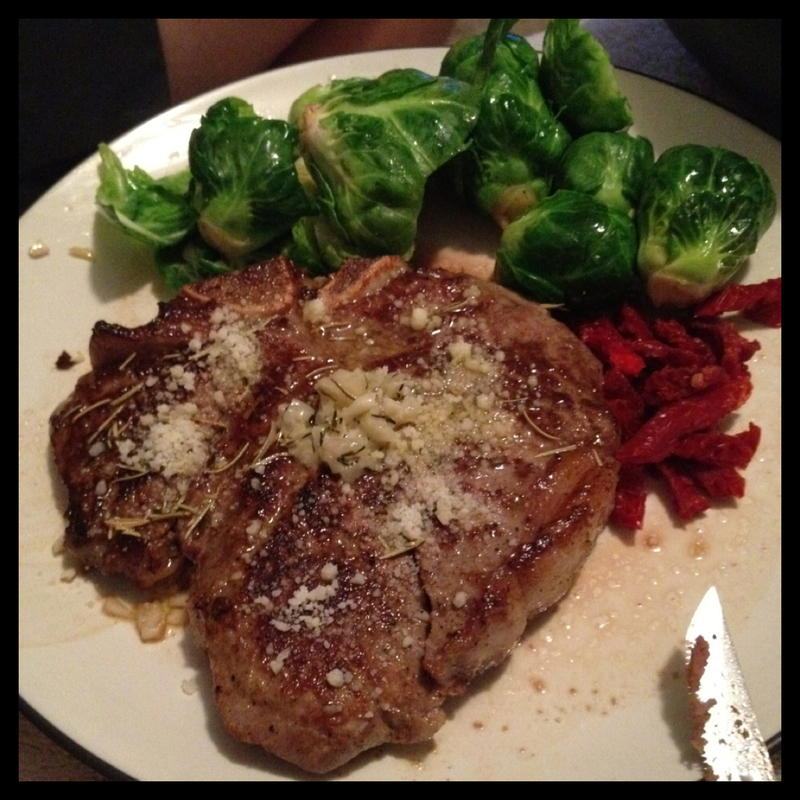 A couple days ago we had some T Bone steak (grass fed, of course) for dinner. 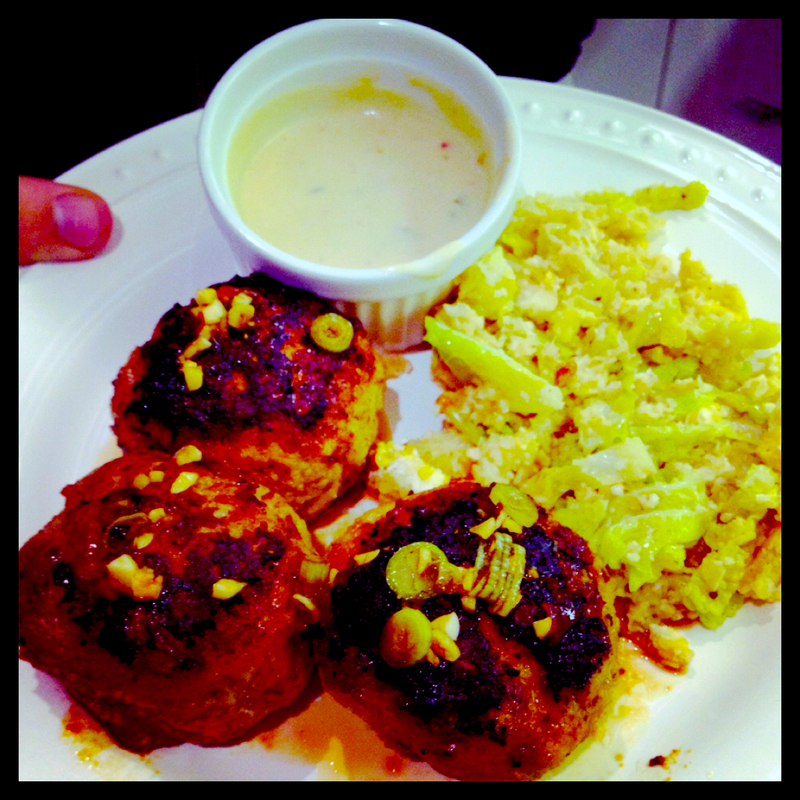 This dinner was ridiculously easy to make and ridiculously tasty. Here is what you need for Easy T-Bone Steak & Herb Butter. Start by de-thawing the steak & putting some salt & pepper on each side. Let the steak sit out until it gets close to room temperature. (I used a tad bit of olive oil to rub down the steak with salt & pepper). Use 1 tablespoon of coconut oil and cook the first steak 4 minutes on each side (if you like your steak medium). 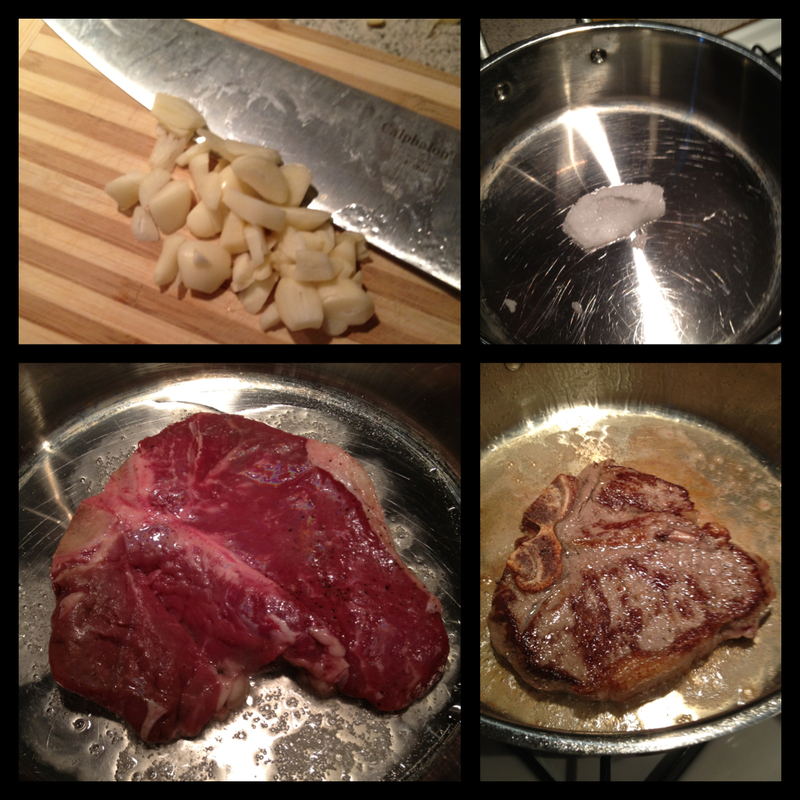 I like my steak medium-well so I cleaned the pan and re did the process but cooked it for 5-6 minutes on each side. I threw some fresh garlic on top when there was about 1 minute left until the steak was cooked (any earlier and the garlic might burn). While the steak was finishing up I started the butter. I use Kerry Gold butter which is grass fed. I used about 2-3 tablespoons of butter. 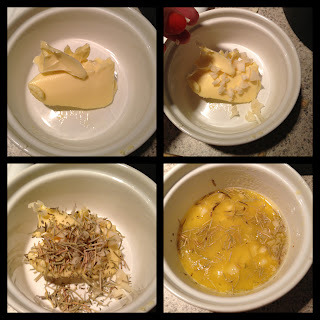 I put the butter in a bowl, added all the leftover garlic (3 cloves-ish), some dried rosemary, a little garlic salt and some thyme. I melted it all together in the microwave and then poured it on the cooked steaks. While this was all cooking I cooked some microwave brussel sprouts and added a little salt & pepper to them with a tad more butter. Then once the steaks were finished I added some fresh parmesan to these suckers and then we ATE. 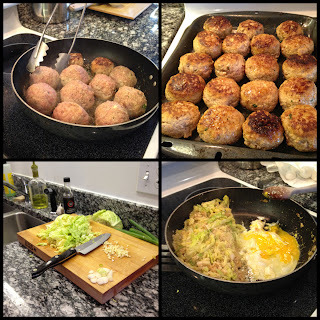 A couple of nights ago we went over to our friend Natalie & Bogg's apartment and Nat made some AWESOME Paleo pork/turkey meatballs, cauliflower fried rice (with egg & cabbage), and spicy coconut sauce. Let me tell you- this was one of the best meals I have had. No joke. 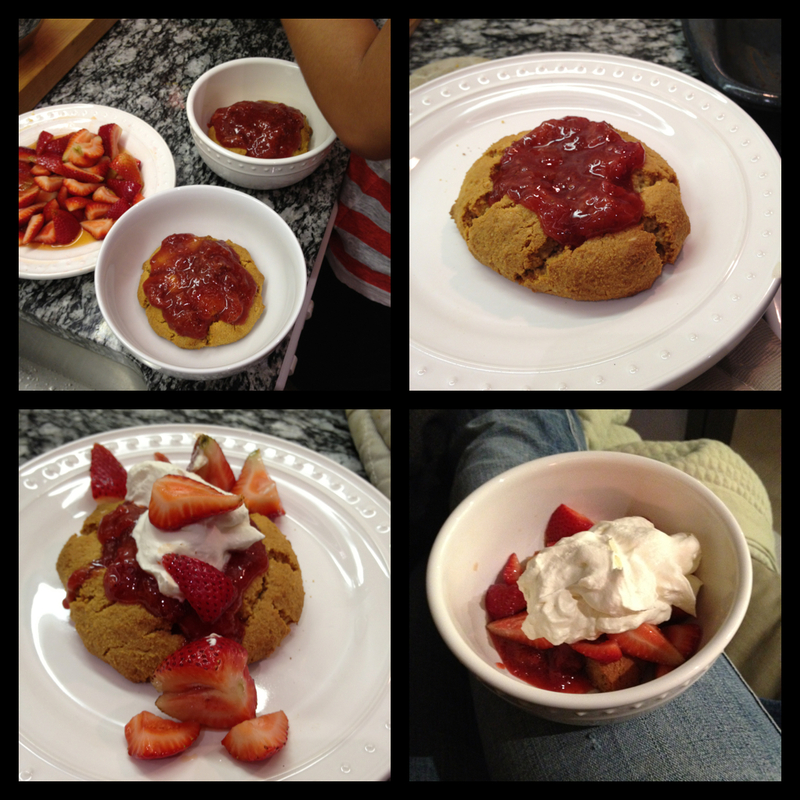 And if this wasn't enough good food for the night Nat made some Paleo Strawberry Shortcake with grass fed whip cream. This is my favorite Paleo dessert and I will add the recipe as soon as I attempt to make this on my own. Yesterday was Matt's birthday!! And we had a great day at the beach with our CrossFit for a beach WOD. 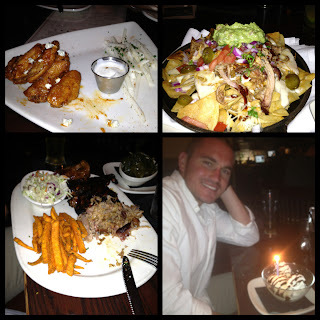 And then we ate at a BBQ place- and let's say we tried to eat Paleo but there were a couple things that snuck in our meal that was very non-paleo (like cornbread, and tortilla chips...oh and beer, woops). 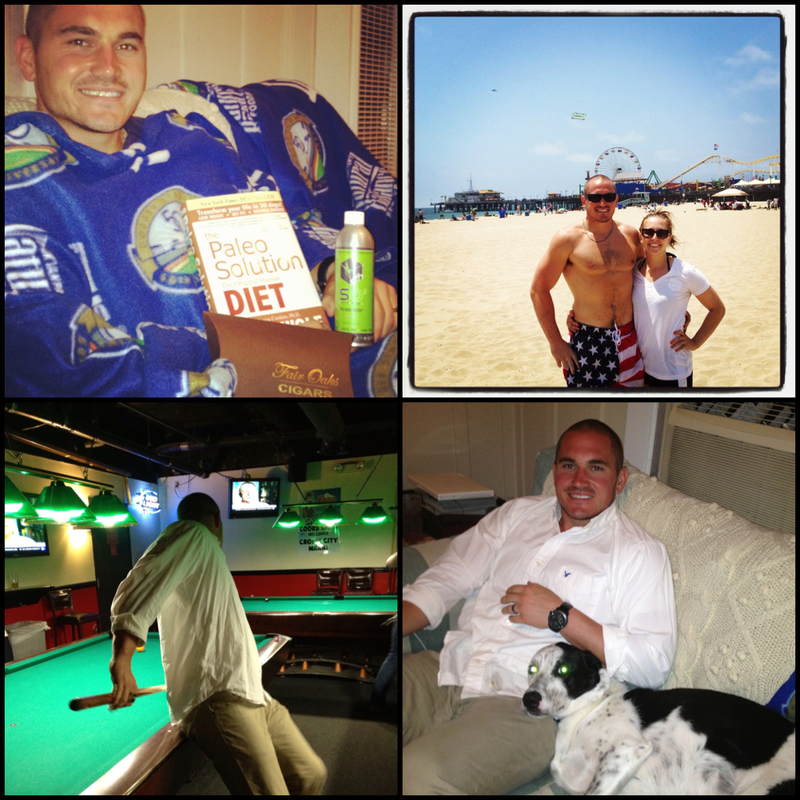 Overall, it has been a great week and weekend. But there is one little thing I have left out...my CrossFit trainer/friend caught wind of a recent opening in the upcoming NLI CrossFit competition- and she signed me up! I got a call at midnight a couple days ago with the news- and I have been excited, scared, happy and anxious ever since. It will be my first CrossFit competition EVER and let me tell you I have been going through a whole lot of emotions. I have always been the type of athlete that gets in my own head too much. I have always been very competitive- almost to a fault- and I have always LOVED competing. But I have always been on a team when I compete and I have been having trouble wrapping my head around the fact I will be competing as an individual. The other thing that has been getting me nervous is the fact that the competition is THIS SATURDAY. As in..5 days. As in I have to be able to do 30 Toes to Bar by Saturday and I can barely string together 2 in a row. So forgive me but I have a feeling the next 5 days of my blog may be leaned a little more to CrossFit and a little less to Paleo- although eating pure Paleo this week and hydrating will be very important for my performance this Saturday. I LOVE YOUR BLOG!!!! Making me miss you tons.